Friday was another scorcher in Tuscaloosa with a high of 93 and high humidity. We didn’t do our morning walk because Anne had to be at the estate attorney’s office first thing. We have a contract on some of Mama Ruby’s apartments but are trying not to celebrate too soon. They aren’t sold until the money is in the bank. Counting down the days until our August 31 closing. After taking care of business we did some shopping. After almost three weeks in Red Bay where there are no Walmarts or Lowes or Home Depots, it was time. We like patronizing the small, local businesses but after three weeks also appreciate the big box stores. We also had a little visit with one of the neighbors who is 94 years old and actually waited until after dark to do our evening walk. That’s the beauty of a well lit greenway. Saturday we were on the road back to Blount County to check on the Aunts. We stopped at the produce stand on the way into town and got another watermelon, tomatoes and peaches. All grown by our neighbors in Blount County. Our county grows some good produce! The Aunts were doing the best we have seen in a while. True they continue their slow decline in some ways but in others they seem to be doing better. Helen’s mind was pretty clear this visit, even though she couldn’t remember things. Best of all they both seemed really happy. Helen doesn’t really want to go home but does want us to move into her house. After a good visit we headed back to the mountain to check on things and gather our mail. Max cut the grass while Anne dealt with two weeks worth of mail. She did not get through it all. After the grass was cut we did our afternoon walk with Barry and Donna. Great to see them again! Sunday we met Barry and Donna for a really good breakfast at Huddle House before church. It was then on to worship. (click here to view the service) Since schools in Blount County start this week, Brother Beck had all the teachers, counselors and school staff come to the alter for prayer. We have a lot of members working in our schools across the county. Brother Beck then had the students come forward and lay hands on and pray with him for the teachers, counselors and staff. What a special time of worship! 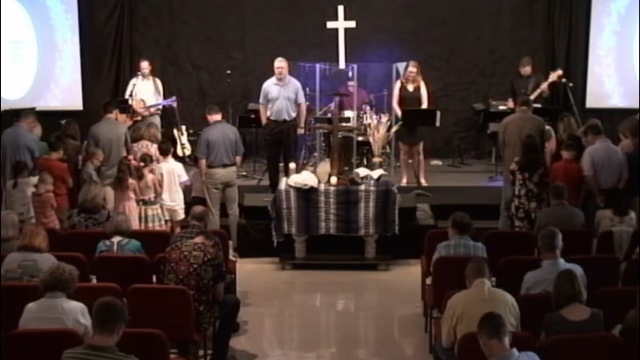 God was truly at work during the entire service, music, prayer, message and communion. Wonderful morning. After Sunday school there was a fund raiser brunch/luncheon for the Senegal mission team, another team soon the go out from our church. We are so blessed to be a part of the Lester Memorial family. After church we went back to visit with the Aunts again and then shopped a little at the outlet mall before heading back to Tuscaloosa. Thankful for another day of safe travel a looking forward to a little play time this week. More on that tomorrow. Hope you all had a wonderful weekend.